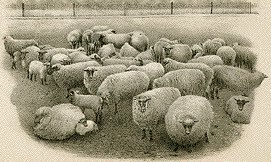 It is well known that one can protect newly sheared sheep from skin infections and pests such as scabies by dipping them in a steaming bath of tobacco juice, sulphur and hot water. I once thought to speed the healing and wool regrowth process by adding Wizard Water© to the mix, but must warn others not to attempt this. The wool will grow out quickly but, owing to the addition of sulphur and tobacco, also tends to ignite easily. The speed of the wool growth, in fact, seems to be what initiates the critical spark. If you happened to see the great illumination on the hillsides of Rancho Los Cerritos back in '81, rest assured that such an event will not happen again. I added a warning to the Wizard Water© labels and the ranch owner Mr. Bixby, after selling a lot of smoked mutton, decided to pursue barley farming. My wife is very frugal and now insists that I keep a notebook and write down everything I purchase, in the belief that I will reduce my spending. It hasn’t quite worked out as she had hoped, however. Now I only buy things that I can spell. We have a lot of beer, beef, and beans, but we are very short on flower. Copyright © 2010 Laurie J. Anderson. All rights reserved. I was all set to stop by the Shields Ethridge farm near Arcade, Georgia yesterday, but Bleb had other ideas. He somehow contrived to leave the barn early that morning, and visited a neighbor’s tobacco-curing shed. I searched for him in his usual haunts – my wife’s garden, the fish pond, Happy Sal’s Dance Hall in town – but could not find him until the neighbor brought him back. “You owe me for that tobacco,” he said. The farmer thought this was a reasonable solution, and so Bleb is spending his days plowing enough land to produce a replacement for what he ate. 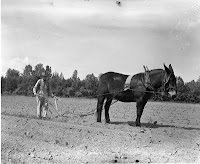 The farmer insisted he start right away, so we had to miss the mule festival at the Shields Ethridge farm. Bleb is duly chastened. He dearly loves a social gathering, especially if it involves others of his kind. I think he won’t make the same mistake again. At least until he figures out how to pick the new lock. Someone once asked me if travel improves a person’s behavior. The answer is no, but it does spread it across a wider area. If your personality is just too big for where you live, a trip across the country might give it enough room to make it useful rather than a liability. I once worked as an assistant for an animal caretaker at a circus. One morning when we were stopped at a small town out West, a giraffe escaped. I was sent to find it and bring it back. I had no wrangling experience whatsoever, and had no idea how I would capture the creature if I did locate it. I needed the job though, so I went out. I asked everyone I met if they had seen a giraffe, but folks just gave me queer looks. 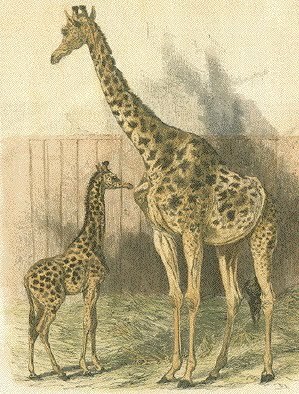 Finally I realized that no one out there knew what a “giraffe” was. When I told a cowboy that I was looking for a long-necked, piebald calf, he nodded and showed me where I could find it. “We ain’t got no call for tree trimming out here,” he said. “There’s so little shade in these parts, I’d hate to see it all get et up. Thanks for the warning.” He was so worried that he roped the giraffe for me. I returned with it two hours after I’d left. My boss was very impressed. “You have a real way with animals,” he said. The other day a former stagecoach driver told me that a single bottle of my elixir saved his life. He was transporting mail between Abilene and Tucson, he said, when he was set upon by a dozen masked gunmen. The gunmen began shooting, and he returned fire. He soon ran out of bullets, though, and commenced to throwing everything he could spare at them – canned beans, parasols, whatever was handy. Nothing helped, until he chanced upon a bottle of Wizard Water©. He threw that, too, but the bottle slipped out of his hand and fell backwards, towards his own team of horses. It hit the rigging, broke, and splashed Wizard Water© all over their legs. Within a minute those legs grew to five times their normal size. Soon every gallop took the coach high above the cactus. The vehicle would sail through the air for a few seconds, then slam back into the trail. At one point the team topped some telegraph poles. The gunmen slowed their shooting, fascinated, and probably unsure of where to aim. Finally, the driver spotted a train in the distance. He urged the horses in that direction. 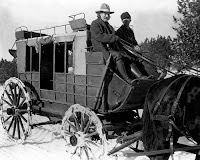 They caught up with the locomotive, leaped, and the entire stagecoach landed in an open car of unshucked corn. The train pulled ahead of the highwaymen. Out-run and out-leaped, the bandits gave up pursuit. Over the next several hours, the legs of the horses began to revert to a normal size. By the time the locomotive finally stopped, they looked like any other set of equines buried waist-deep in grain. When the stationmaster saw the coach in the corn, he insisted that the driver pay full passage for himself, the stagecoach and the team. This happened many years ago, said the driver, who quit the postal service shortly thereafter to join the Texas Rangers. “I wanted a job that was less dangerous than transporting mail," he said. "I can face armed bandits. What bothers me is surprise cargo. Also, when we started clearing the tops of the cactus, I couldn't help thinking that the good Lord did not intend for us to drive to heaven."